Use this Help Guide when you have any questions on how to use your linear PCM recorder. The recorded file is noisy and is hard to understand. The recorded file is noisy and you want to record with less noise. A rustling noise is recorded. A clipping or breaking noise is recorded. Noise is recorded when you use an external microphone (not supplied) for recording. You hear noise when using the headphones (not supplied) for playback. The volume of the audio you recorded from an external device is low or you hear squeaking noises when you listen to the audio via the built-in speaker. You hear noise during playback even with the Clear Voice function turned on. 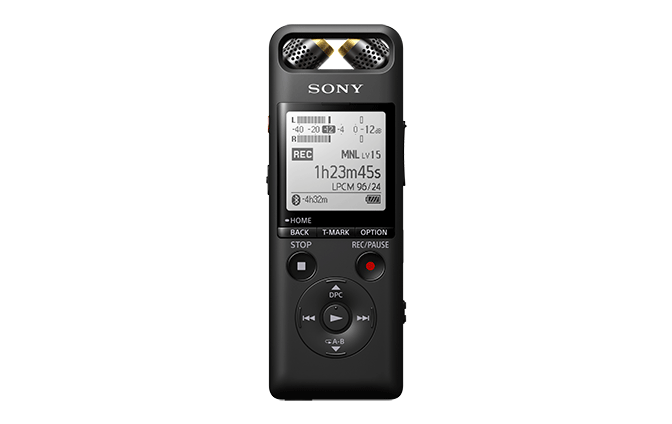 The linear PCM recorder does not turn on or pressing any button does not work. The linear PCM recorder does not turn off. The linear PCM recorder automatically turns off. The battery life of the linear PCM recorder is short. You cannot charge the battery by connecting the linear PCM recorder to your computer. The battery indicator does not appear on the display window or it disappears in the middle of charging. The charge error indicator is flashing where the battery indicator should be displayed. The linear PCM recorder does not operate correctly. You cannot store recordings on the SD card. The input audio volume is too loud or not loud enough when you record audio from an external device. Recording from another device stops on its own. The playback volume is low. You hear no sound from the built-in speaker. You hear sound from the built-in speaker even when headphones (not supplied) are connected. The Equalizer function does not change sound quality. You cannot move a file. You cannot copy a file to a different folder. Track marks are not detected. The folder or file you created is not displayed. The recording date of a file appears as [----/--/--] or [--:--]. The remaining recording time on the display window is shorter than the one displayed on the computer. The [Memory Full] message appears and you cannot start recording. The [File Full] message appears and you cannot operate the linear PCM recorder. The microSD card is not detected. A folder or file name appears in unreadable characters. Copying a file takes time. The linear PCM recorder is not detected by the computer and you cannot transfer folders/files from the computer. The file you transferred from the computer does not appear on the linear PCM recorder and you cannot play the file. The computer does not start. You cannot establish a Bluetooth connection. You cannot establish a Bluetooth connection with the one-touch operation (NFC connection). You cannot control the volume of the Bluetooth audio device. You cannot make device registration (pairing) between the linear PCM recorder and the other device. You cannot install Sound Organizer 2. The linear PCM recorder is not detected by Sound Organizer 2. The playback volume of the computer is low or you hear no audio from the computer. You cannot play or edit stored files. The counter or slider does not operate correctly or you hear noise. Operations slow down as the number of stored files increases. The computer seems to freeze while a file is being saved, added, or deleted. Sound Organizer 2 freezes during start-up.